Thanks to all Patreon subscribers, this is a page that hosts the standalone and random comics I have created over the years. If you are interested in becoming a subscriber, please take a look at my Patreon page and consider contributing $1 to read my comic uploads, including new and edited Biomecha pages. My comic pages are uploaded on a monthly basis! 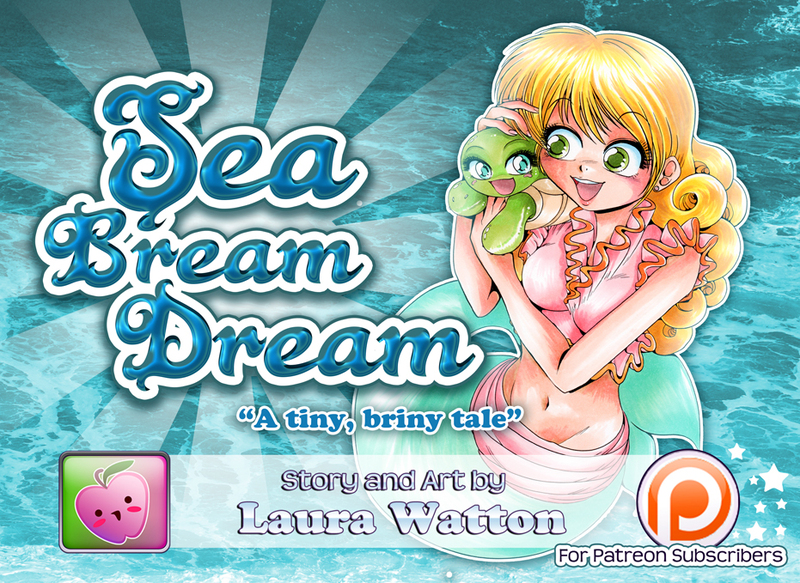 Sea Bream Dream is a Tiny, Briny Tale! Click here if you are a Patreon subscriber!! Reluctant Soldier Princess Nami is a stupid and fluffy A-Level British Magical Girl story! Arc 1 of 3! Drawn with dip pen nibs, indian inks, the usual fineliners plus actual sticky backed tone, it was presented in a collected volume I ran in 2008 and has been out of print for ages. Click here if you are a Patreon subscriber!! Reluctant Soldier Princess Nami Arc 2 (of 3) is three segments long, Part 2 actually clocks in at 32 pages! This part of the story was drawn over the year 2000-2006 (!!). Nami has grown up a bit and takes part when she lives away and attends college, but the experience is dull. Whatever happened to her inbetween parts 1 and 2 has made her very grumpy! Drawn with brush pens on A4 (somehow?! ), plus fineliners and half sticky backed tone, half early computer tone, Arc 2 was also presented in the collected volume which has been out of print for years. Click here if you are a Patreon subscriber!! Reluctant Soldier Princess Nami Arc 3 (of 3) is the final and third segment, and is a neat 20 pages in total! This story was drawn in 2008 and completed the Arc Trilogy of RSPNami. My hilarious friend Nayyar Mughal wrote the snarky script; it is my favourite arc in the series. Drawn with (back then very new and exciting) Japanese pen nibs, indian inks and imported into Manga Studio 3, Arc 3 was also presented in the same collected print volume and has also been out of print for yonks. Click here if you are a Patreon subscriber! !